A beast in Byron Bay. 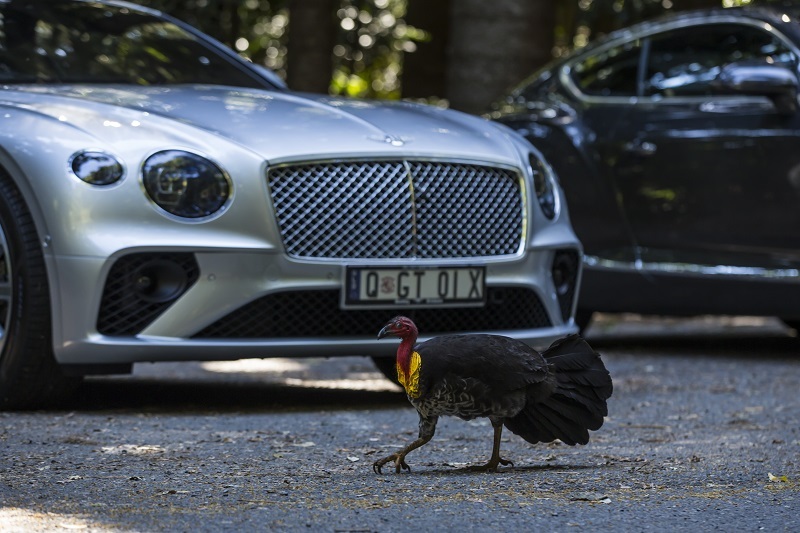 Even wild turkeys want to see the new Continental GT up close. One approaches the tyre with bold curiosity while its mate hangs back, wary of the small crowd and their cameras. We are parked in Springbrook National Park, in the Gold Coast hinterland of Queensland, Australia. 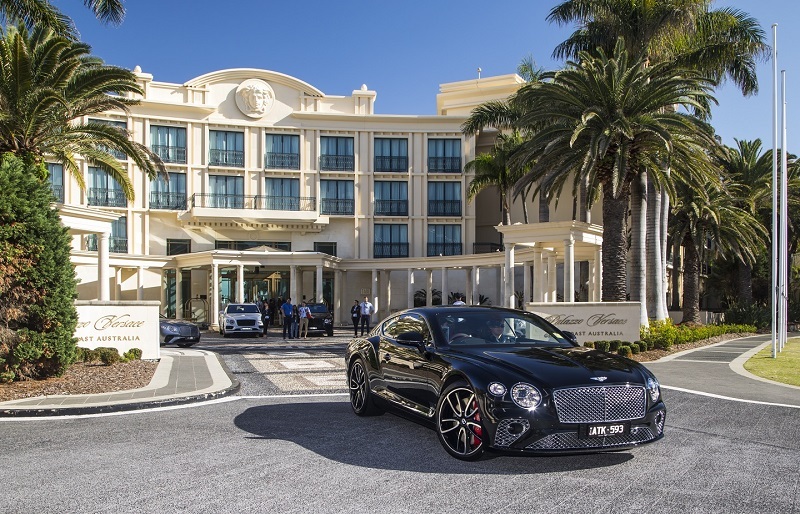 In true turismo fashion, Bentley thought it best to experience the latest comprehensive update of the flagship GT in a locale for which the luxury ride was designed, segueing smoothly from the well-paved roads of central Brisbane to the remote country trails of coastal Byron Bay. Springbrook is a stop along the route, a break to take in the renowned natural wonder of our host country as well as perform a driver change so each pair has the chance to experience being behind the wheel and taking it easy in the passenger seat. After years of marvelling at the gross incompetence of Kuala Lumpur drivers, I have become a sworn convert to the latter, but this is not just any car. Like Spider-Man’s comeback with Tom Holland as Peter Parker, this first completely new Continental GT in 15 years is worth the wait. It is the quintessential grand tourer, reimagined with phenomenal power and an exquisite aesthetic to match. Credit for the power goes to a freshly designed 6.0 litre, twin-turbocharged W12 engine with an 8-speed dual clutch transmission for smooth and efficient gear changes, a necessity in a model that goes from 0 to 100kph in 3.7 seconds. Variable displacement technology in the chassis disengages an entire bank of cylinders at gentle throttles to reduce the number of working cylinders to six for optimal fuel consumption. Put the pedal to the metal and it summons all 12 cylinders for robust acceleration. I would hazard a guess that the turkeys aren’t interested in what is beneath the bonnet. I couldn’t even say for sure that they are drawn to the dynamic design, a painfully overused phrase but entirely deserving here. The sleek lines, handcrafted into fluid contours, using the aerospace technique of superforming to produce complex surfaces, infuse purposeful dimension, as does the fuselage surfacing seen in the curvatures of the rear haunch lines. A piano-finish paint process and a pre-programmed sequence of exterior lighting call attention to key outlines, so just approaching the vehicle arouses anticipation. A stunning design language evokes the finest craftsmanship of similarly opulent industries. The jewel-cut headlights were inspired by crystal whisky tumblers with their detailed facets, while the sumptuous interiors take their cue from the sharp suits of Saville Row. That the machine is crafted entirely by hand opens up possibilities for any customisation conceivable. Existing commissions include dual-veneer trim that contrasts natural-grain wood with minimalist or elaborate black finishes, or a choice of eight single veneers. Have the wide centre console dressed in an intricate Côtes de Genève finish found in fine timepieces or opt for diamond quilted leather on the shoulders of the seats, visible from the outside, to enhance the sense of tactility in the lavish cabin. There are 15 interior hides to choose from to cover everything from the seats and dashboard top to the door panels and headliner. The potential to grant any wish means your customised product could be the only one of its kind. Designed to form the pinnacle of design and technology, the nifty Bentley Rotating Display is a tri-faced section of the dashboard that can be rotated to deliver your preferred aesthetic. It swivels from high-resolution touchscreen display to a set of analogue dials (stopwatch, temperature gauge and compass) with polished chrome bezels and, finally, a blank veneered panel for an uninterrupted, flowing dashboard. This allows you a modern or vintage interaction with the car or the final option of ignoring readings altogether to focus wholly on driving. I flit between the first two as we set out from the Palazzo Versace Gold Coast that morning to head to Picadilly House, a grand villa atop a hill in Byron Bay overlooking a valley and the Pacific Ocean beyond. For the first time on an international drive, I almost wish I was back in Malaysia. Australians’ strict adherence to speed limits puts a damper on driving and I could only imagine what this vehicle could do on a quiet highway at home where speed limits are seen more as guidelines by some. The super-coupé reaches a top speed of 333kph but built-up areas here have a speed limit of 40 to 60kph and we only hit the maximum 110kph for short stretches on the busy motorway. 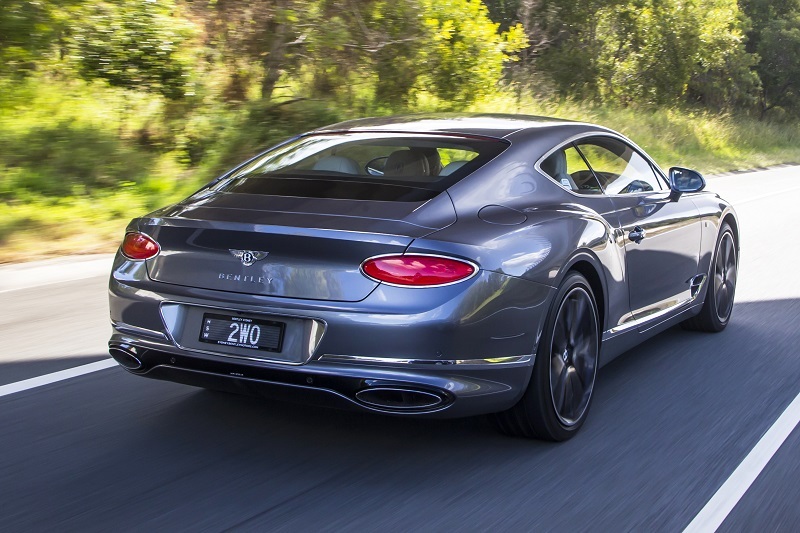 I am by no means a speed demon but the Continental GT drives so smoothly that it took effort to keep it under the speed limit; it glides forward at the lightest touch and restraining it was akin to having to constantly tighten the reins of an eager horse. I am so exasperated at trying to pull back on speed that after playing around with the modes — a luxuriant Comfort in the city and the more spirited Sport for winding country lanes — I activate cruise control and turn on the massage function of the driver’s seat, settling in for an easy drive. Even with my eyes on the road, I am aware of my immediate surroundings. 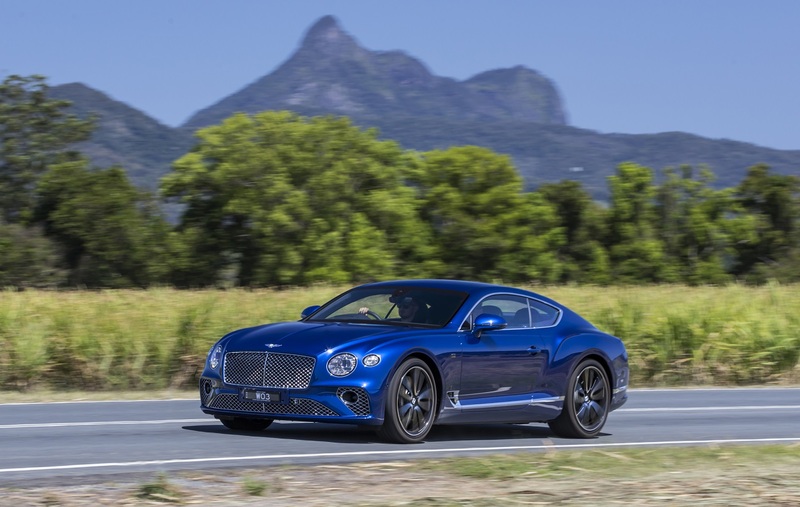 Bentley desired interiors that were sensorially immersive and the new Continental GT is designed to texturally intrigue, from the mixed materials of the electrically-powered steering wheel to the suede of the ceiling. I am driving the basic model while another pair in our party has the full-spec First Edition that wears its Britishness proudly on its sleeve with Union Jack accents. It quickly becomes apparent why customers are faithful to the luxury automaker. I make up for the lack of speed with careless turns and the car absorbs my wild corners, holding steady and not overswinging. It brakes and picks up effortlessly across the different terrains, the 48V Active Roll Control system seamlessly adjusting to road conditions for optimal handling. The four-wheel drive largely behaves as a rear-wheel system but diverts power to the front when extra grip is called for. The steel brake discs (they can be upgraded to carbon) are the largest on any production car, adding to its virile visual. Considering its gross weight of 2,715kg, it is surprisingly agile and the low body encourages a dialogue with the road. We purr silently through the hinterland, leaving no trace of our passing until we pull up into the narrow driveway of Picadilly House in single file. The villa sits on a sprawling five-acre estate, a vision of classic architecture executed in heavy timber and old-fashioned masonry. A sedate white and wood palette is shocked by an explosion of deep pink wisteria and the vivid blue of a curved infinity pool. Lunch has been arranged for our party on the shaded patio and as we head to the beautifully set up long table, we are distracted by an unusual sight. All around us are dips and peaks of lush green, tapering off into a blue horizon as the ocean meets the sky. 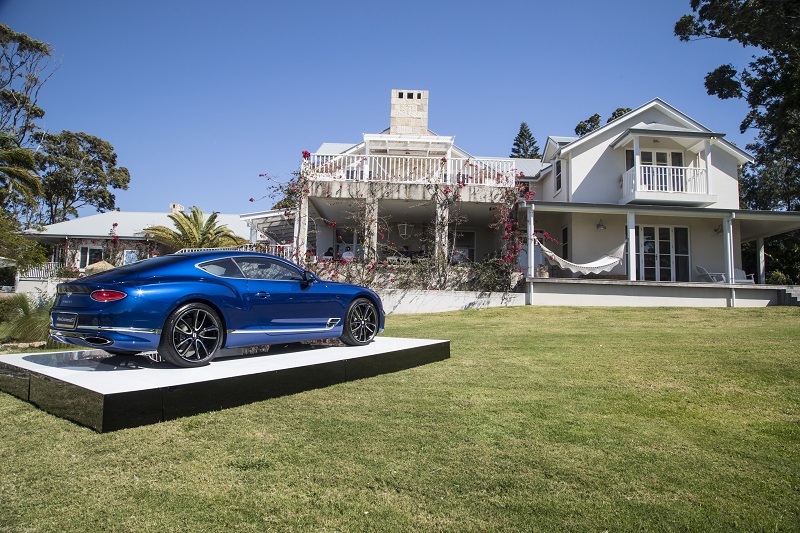 However, rising from the descent of a slope metres away from the patio is a gleaming Continental GT on a white platform. It looks incongruous in this landscape, the only work of man in an expanse of nature as far as the eye can see. Though absurdly out of place, there is also something right about this view. You expect Bentley to do the unexpected, to go above and beyond to be in places no other automaker would or could. It seems bizarre to have a super-coupé here, with no paved path in sight to suggest that this is the done thing. Then again, Bentley’s select clientele is far from ordinary or predictable. Tradition and craftsmanship run so deeply in the brand’s legacy that it could never stray from its innate elegance but the British label does not lack imagination. You go places with a Bentley, in more ways than one. Sometimes that means the crest of a hill no car has ever left its tyre tracks on.